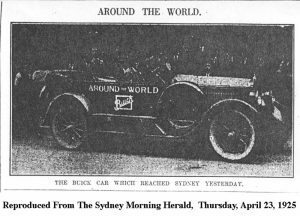 A motor car which is being driven around the world arrived in Sydney at about 10 o’clock yesterday morning and left for New Zealand in the evening. The car is a standard six-cylinder touring model Buick, which left New York about three months ago, and has since traversed parts of Europe, Asia, Africa and Australia. After passing through New zealand it will be shipped to San Francisco and complete its journey by crossing the United States of america to New York again. The object of the journey is not to establish a speed record, but to demonstrate the strength of the Buick service throughout the world. The reliability of the car is emphasised by the fact that it is never for very long in the hands of the same driver, but has been passed on from city to city and country to country by a relay. The car carries an elaborate parchment log on which is recorded the names of the different towns and cities it has visited, the driver and, in many cases the signature of the American consul. From New York it was shipped to Liverpool, England and driven from there, via Manchester, Birmingham, Nottingham, Swindon and London, whence it was shipped to Amsterdam, Holland and driven by a Dutch driver to Brussels, Belgium. The Belgium driver who took it over in Brussels drove it to Paris, France and a frenchman then took charge as far as Marseilles, where it was shipped to Cairo. Egypt then provided drivers who took it to Port Said and through Palistine to Jerusalem. The drivers from Jerusalem were at the wheel while the car passed through Beirut and Damascus to Baghdad, traversing Mesopotamia and Iraq, apparently including an Arab, judging by the name signed on the log, and from Baghdad, Persia, whence the route lay through Persia to Basreh. At Basreh the car was shipped again to Bombay, India and driven via Agra to Calcutta: shipped again to Colombo and driven all around the island of Ceylon, and shipped once more to Fremantle, Western Australia. At Fremantle, Mr E.G.Langdon took the wheel and drove the Buick to Adelaide, where Mr H.L.Searcy took over and drove to Melbourne. From Melbourne Mr. R.T.Lane drove to Albury, where Mr P.A.McIntosh, who was accompanied by Mr Jack McManus was waiting. Mr McIntosh took over the car on Sunday evening, and on Monday morning set out on the drive to Sydney. AROUND-THE-WORLD TRIP – BUICK’S BIG DEMONSTRATION. Christchurch motorists will be interested to know that to-day the Buick round-the-world car will pass through the city. The N.Z. Automobiles, Ltd., Buick distributors in this city, are driving the car on the present lap of its long journey around the globe. When the Buick Motor Company and the General Motors Export Company, working in collaboration on this plan, decided to send a Buick Standard Six touring car around the world, it was with two definite objects in view. The first was to demonstrate the stamina and reliability of the Buick Standard six model-the newest and most popular of 20 years production of Buicks. The second object was to show to the public how extensive is the Buick service organisation. This is being accomplished by a novel method of handling the car itself. No single driver or mechanic goes with the car; instead, it is driven everywhere by Buick distributors and dealers, who in a chain unbroken, except by necessary water hauls, are taking the car from New York eastward around the globe back to its starting point. Every mile of land that this car is traveling on its round-the-world trip is covered by Buick owner-service. The route includes England, Holland, Belgium, France, Egypt, Palestine, Syria, Mesopotamia, India,Ceylon, Australia, New Zealand, and the United States. The new Standard Six model, with a wheelbase of 114 3-8 inches (2.9 metres)and engine bore and stroke of 3 inches (76 mm.) and 4.5 inches (114. ), is a slightly smaller edition of the well known large Buick Six that Buick has been building for many years past, It is a four-wheel brake car, equipped with low pressure tyres, and engineered throughout to meet requirements of the owner who wants a sturdy, reliable, yet comparatively low-priced car with 6 cylinder smoothness and rapid acceleration. The present Buick trip around the world is simply a rather spectacular demonstration of what has been in effect for some time past-namely, the locating and equipping of Buick service stations at strategic points that will ensure Buick owners throughout the world having convenient access to Buick replacement parts and skilled mechanical assistance. To this policy, the Buick Motor Company largely attributes the unusual popularity of its product in all countries. During the time the round-the-world tour has already been on the road, no mechanical or other trouble has developed, and runs have been made exactly on schedule. 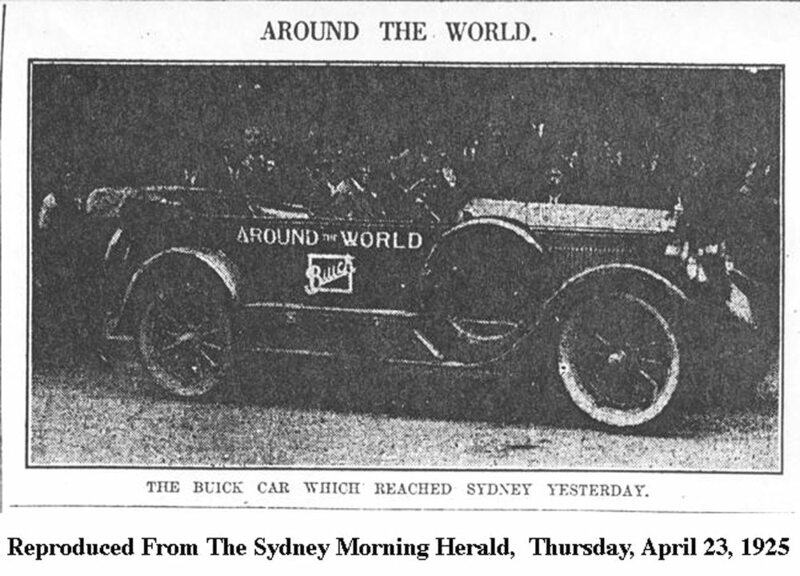 The round-the-world Buick car passed through Ashburton late yesterday afternoon, and was driven through the town by the local agent, Mr W. Page. So far the car has travelled 21,000 miles through America, England, Germany, France, Poland, Palestine, Australia, and New Zealand, and has only 5000 miles to go to complete its long tour, on which it has been taken by the agents in the various. districts through which it has passed. Despite rough usage in heat and cold, the engine ran beautifully in a 45-mile-an-hour clip out of Asburton. To all intents and purposes the luxuriously equipped touring model conveyed no other impression than that it had recently been unpacked from its case and had spent a few light months on South Canterbury roads. In the few short months of its life, however, the stock model light six cylinder Buick car which arrived at the Borough Council Chambers shortly before two o’clock on Wednesday afternoon in order to obtain an official memento of its visit to Timaru in the shape of the Town Clerk’s signature in its log book, had travelled far and poked its brightly polished nose into many strange and decidedly interesting corners of the world. encircling the town, Basra, on the West bank of the Euphrates, provided an outlet via the Persian Gulf and the Arabian Sea to India, where after touching at Colombo to tour Ceylon the car was shipped a distance of 3120 miles to Perth. done over 14,000 miles, up to the present 11,000 having been registered. Throughout the journey the car has been handled exclusively by Buick dealers in the various territories through which it has passed, no drivers or mechanics traveling with it on tour other than those responsible for taking it through their individual territories, and with the exception of tyres being changed no mechanical repair work has been effected. The car on arrival at the local Buick agency, Bockaert’s garage was running exceptionally well, and showed little trace of the severe test to which it had been subjected. The services of the local dealers, Messrs Culling and Meredith, were placed at the disposal of the driver, who left shortly before three o’clock to take the car across to the North Island agents who will be responsible for its further transit through New Zealand on its round the world trip, a trip which is not only providing a severe mechanical test for the car itself, but also demonstrating beyond doubt the wonderful efficiency of the Buick organisation…. Local motorists will be interested to know that today the Buick round-the-world-car will journey through Dunedin. Messrs Cooke, Howlison and Co. (Ltd.), Buick distributors, who are driving the car on the present lap of its long journey around the globe, have supplied us with information about this unique trip. When the Buick Motor Company and the General Motors Export Company, working in collaboration on this plan, decided to send a Buick Standard Six touring car around the world, it was with two definite objects in view. The first was to demonstrate the stamina and reliability of the Buick Standard Six model. The second object was to show to the public how extensive is the Buick organisation. This is being accomplished by a novel method of handling the car itself. No single driver or mechanic goes with the car. Instead, it is driven everywhere by Buick distributors and dealers, who in a chain unbroken except by necessary water hauls are taking the car from New York eastward around the globe back to its starting point. (1) The 1400 mile stretch ‘between Port Said, Egypt, through Jerusalem, Haifa, Beirut, and Baghdad, down to Basra on the Persian Gulf. (2) The trans-India trip from Bombay to Calcutta. (3) The stretch of over 2000 miles across Australia from Perth to Sydney. (4) The 3000 mile stretch from San Francisco back to New York, the full width of the United States. The present Buick trip around the world is simply a rather spectacular demonstration of what has been in effect for some time part-namely, the locating and equipping of Buick service stations at strategic points that will ensure Buick owners throughout the world having convenient access to Buick replacements, parts and skilled mechanical assistance. Messrs Cooke, Howlison and Company’s representative, who is driving the car from Dunedin to Invercargill, is scheduled to leave Dunedin at 1.30 p.m. to-day, arriving at Invercargill early this evening, when the car will be handed over to the Invercargill Buick distributors, and the necessary documents duly signed and witnessed. To-morrow evening the car returns to Dunedin driven by the Invercargill Buick distributors representative, and early on Wednesday morning the Dunedin representative starts the the car on its return trip to Lyttelton and the North Island. As no doubt a number of motorists will wish to inspect this car, Messrs Cooke, Howlison and Company (Ltd.), have arranged for it to be on view at Hanover Street Garage, between the hours of 11 and 12 today. Early this year mention was made of a novel means of demonstrating the durability of the 1925 Buick car, which took the form of a world tour, the car being driven over the various stages of the route by a chain of service station drivers. The tour started from London at the beginning of the year, and after successfully traveling through England, Holland, Belgium, France, Egypt, Palestine, Syria, India, and Ceylon the car was shipped to Fremantle. The trans. route from Western Australia to Adelaide and Melbourne was then negotiated. The Buick next journeyed to Sydney, and then followed a tour through New Zealand. Today the car will arrive in Dunedin from Christchurch. It will then be taken over by a driver from the local Buick people, and driven to Invercargill. It will then be driven back by an Invercargill agent, and a Dunedin man will take it on to Christchurch. The car will then be shipped to San Francisco, and be driven across to New York, thus completing a world’s tour under unique driving conditions, as no single driver accompanied the car, Buick service stations along the route supplying a driver to take the car over each successive stage. Southland Topics – Invercargill, May 8. Considerable interest has been manifested amongst motorists of the district by the appearance in Invercargill of a Buick Standard Six motor car which arrived in Invercargill recently. The car left New York, and was shipped to Liverpool on December 20, 1924. It has since travelled through England, Holland, France, Port Said to Gaza, Jerusalem, Syria, Mesopotamia, India and Ceylon and Australia. It has now encircled half the world, and on arrival in Invercargill the Mayor’s seal was made on the log-book, after which it was sent on to Dunedin. The trip from Gaza to Baghdad, over the Syrian desert has been, so far, the roughest part of the trip, and the run over the Lebanon mountains was extremely difficult. Through all its trials, however, the Buick car has stood up well. The car, when it reached Invercargill, was actually one day ahead of the scheduled time arranged for it months ago. unique journey after traveling more than half the distance. and countries being set down in advance and it is pleased to note that the car is a day ahead of the scheduled time in reaching Invercargill. In order to make the feat a more unusual one, no driver was sent with the vehicle. It is simply handed on from agent to agent right throughout the world. This idea was conceived so as to show the world-wide territory in which Buick agents can be found and the wonderful organisation Buick possesses. Each district agent meets the car on his boundary, drives it through his territory, then hands it on to the next agent and so on. mishap. The bonnet is locked as well as various small compartments containing the “spares” and the keys are handed on from dealer to dealer with the car. Probably the most interesting part of the car is the “log.” This is a formidable looking document containing practically a resume of the car’s travels. In the log the various drivers of the car state the distance travelled and certify having driven the car from one point to another point. Their signature is witnessed by the Mayor or some other responsible person in the towns visited. the car is specially “tuned up” by each agent who receives it. Up to the present time the car has travelled through England, then shipped to Holland and delivered to Amsterdam Buick representatives on January 8th. Amsterdam to Brussels, to Paris, to Marseilles. Shipped from Marseilles January 20th, landed Port Said to Gaza, to Jerusalem, then to Syria, Mesopotamia, India, Ceylon. From Ceylon to Perth, then run to Adelaide, to Melbourne, to Sydney, arriving at the latter place on 22nd April. Shipped from Sydney April 24th. Scheduled to arrive at Auckland on April 29th, then Wellington to Christchurch, to Dunedin, to Invercargill. It has now to return again to Auckland then touch Honolulu and back across the States to New York. On Monday morning, Mr A. Russell the Southland Buick representative, accompanied by Mr A.J. Campbell, photographer, journeyed to Clinton, the boundary of Mr Russell’s territory, to take delivery of the car from the Otago representatives Messrs Cook and Howlison. At Gore, Mr J. S. A. Aitken ( Gore agent), J. Green, jnr., ( Riversdale agent), and E.Lister ( Wyndham agent), joined the party and went to Clinton to await the arrival of the car from Dunedin. Promptly to time, at about 4.30 the Buick arrived at Clinton and Mr Howlison officially handed over the keys and the car to Mr Russell. Mr green then drove the car to Pukerau and Mr Aitken piloted the car for the rest of the journey to Gore. Mr Russell took the wheel from Gore to Invercargill arriving at about 8 o’clock. wonderful performance that the Buick had accomplished. To-day the car was displayed in the firm’s garage and at eleven o’clock the Mayor, Mr A. Bain, signed the necessary affidavit of its having reached Invercargill. Wyndham and Gore were then visited and the car returned north to Dunedin later in the afternoon. The advent of what is termed an “all round the world” car visited Gore yesterday and created a very considerable amount of attention from a large number of not only towns-people but the farming community also. The car appeared to be a standard Buick, and it shows the reliability and good quality generally of this particular make of car when we consider the many thousands of miles it has travelled and to all appearances with little or no damage. Our worthy Major and a large number of ladies and gentlemen who assembled were photographed. The arrival of the much-talked-of Buick was termed by all as not only interesting but instructive also. It was shipped to England, and driven through the country, subsequently visiting the Continent of Europe, the East, and Australia. From the Commonwealth, its course lay to Auckland, and now, having been taken through both Islands it is in the South. The car is running to schedule time, the method being that at each town visited the Buick agent takes it on to the next stop, where he relinquishes control to the next man, and so on, so that by now, the car must have passed through the hands of very many drivers indeed. Mr A. Russell, the Invercargill agent, will take over the car at Clinton today, and is due here at 8 p.m. To-morrow morning, the Mayor, Mr A. Bain, will be asked to enter his name in the log-book that accompanies the Buick, much the same procedure as that followed by a world-walker who recently presented his diary to a local Magistrate, and then will return to Auckland, en route to San Francisco, where the final stage of the journey back to New York City will begin. Considerable interest is being displayed locally in the visit of the car, especially as it is no special model, but simply a car from stock. being reached at 5.50. Then at 6.5 the last stage of the journey to Invercargill commenced and traveling slowly in order to reach town at 8 o’clock the arrangement worked perfectly. At Conon street a large number of people had gathered to welcome the car, while the Battalion Band was also on the scene to play the “visitor” through the city. This was carried out with great gusto, and and all along Tay and Dee streets large numbers thronged the thoroughfares anxious to catch a glimpse of this much-travelled Buick, which is similar to any other Buick car in design except that it carries a set of four spare wheels and extra parts as well as a spade, hatchet, etc., for use in the more remote regions should the emergency arise. This morning the car will be driven around the city and a call will be made on the Mayor (Mr Andrew Bain) at 11 o’clock for the purpose of getting his signature affixed to the elaborate log, which is a most important document, as it shows conclusively that the car is carrying out the full program mapped out for it by the manufacturers. The return journey to the north will be commenced at about 11.30 to-day, when Mr Russell will take it through Wyndham and Gore back to Dunedin, where it will remain overnight. The following morning Messrs. Cooke Howlison and Co. will again assume control and will conduct the journey to Oamaru, where the Christchurch agents will take the car over and drive it on to Lyttelton. On arrival in Wellington the journey northward o Auckland will be again undertaken by way of Wanganui and New Plymouth. Then the car will be placed on board a boat for Honolulu and after traversing the Hawaiian island it will go on to San Francisco where the long trek across the United States to New York will commence and so complete the encircling of the Globe. At 1 o’clock today, there will arrive in Wyndham a motor-car which has seen far more of this mundane sphere than the great majority of those in our town who will, no doubt, assemble in large numbers to view it. This car is one that Buick Co. sent on a world tour from New York on December 20, 1924. It was shipped to England, and driven through the United Kingdom, subsequently visiting the Continent of Europe, the Far East, and Australia. Thence its course lay to Auckland; and now, having been through both Islands of N.Z., it is in Southland. much-travelled automobile has passed through many chauffeurs indeed. Naturally, much interest is being evinced locally in the visit of this nomadic Buick, regarding which our Chief Citizen will sign a statutory affidavit.